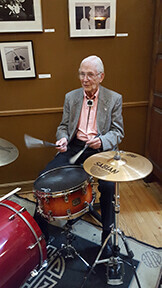 Reed Art & Imaging would like to extend belated happy birthday wishes to Denver photographer, teacher and lecturer, James O. Milmoe, who celebrated his 90th birthday at the Cactus Club in LoDo on April 21st. James Milmoe is good at a lot of things. Known for his trademark bolo ties (handmade by the man himself!) the photographer is equally well known for his outgoing personality and easy sense of humor and, of course, his many roles in the Denver creative community. His body of work is well-represented in practically every facet of modern media, including books, catalogs, magazines, newspapers, calendars, note cards, postcards, motion pictures and television. of America, a recipient of the Colorado Governor’s Award, and a member of the American Society of Magazine Photographers. 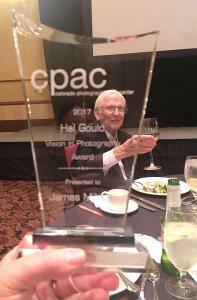 He also helped found the Colorado Photographic Arts Center (CPAC), so it should come as no surprise to anyone that he was honored this year with the 5th Annual Hal Gould Vision in Photography Award. James is still working and exhibiting, with two recent shows, Up Close and Far Away: The Photographic Art of Jim Milmoe at The Pattern Shop Studio on Blake Street, Denver, and Stop/Look/See Photography by James Milmoe, at The Arvada Center. Don’t forget to catch Jame’s appearance on the Arts District show on RMPBS, where he talks about what ‘Stop, Look and See’ can mean to the experience of looking at, not just the art of photography, but art and life in general.